The constellation Sculptor. Roll mouse over to see labels. 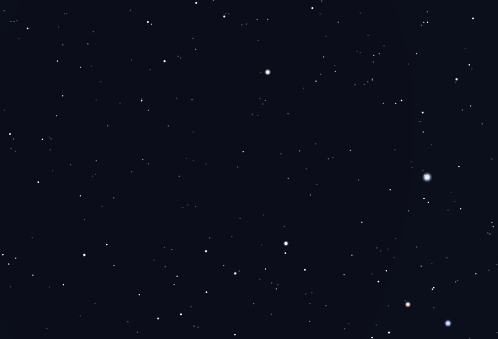 Sculptor is a faint constellation in the southern sky, visible in the evening sky in the months around September. Nicolas Louis de Lacaille first gave the name ‘Apparatus Sculptoris’ (the sculptor's studio) to this sky area, but it was later abbreviated to simply ‘Sculptor’. It has no stars brighter than fourth magnitude, but does contain a number of galaxies of interest, including the Sculptor Group of galaxies – the closest grouping of galaxies to the Local Group of which the Milky Way is a member. Among the brighter members of this group are NGC 253 and NGC 55. It is also home to the Sculptor Dwarf Galaxy, a small and very diffuse galaxy which is in orbit around the Milky Way. It covers a similar sky area to the full moon, and yet its total brightness is only tenth magnitude, meaning that the very darkest skies are needed to see it. Sculptor lies 90° away from the plane of the Milky Way, and contains the south galactic pole. Sculptor contains the following Caldwell objects: C65, C70, C72. 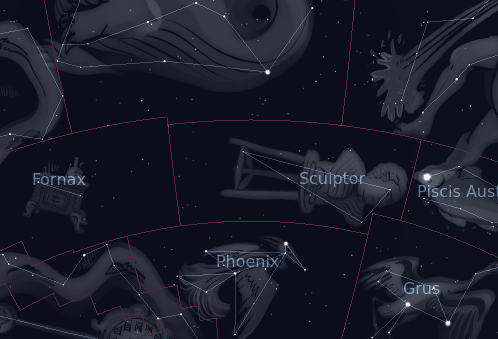 The following constellations neighbor Sculptor: Aquarius, Cetus, Fornax, Grus, Phoenix, Piscis Austrinus.